A glaring omission from almost all biotech discussions of genetically engineered crops is the fact that not one, but a host of chemicals is required to grow them. Perhaps the word ‘required’ is overwrought with cynicism, but “over 75 percent of GMO crops are engineered to tolerate being sprayed with herbicide.” This means that if one were to honestly and accurately portray the safety of GM crops, they would also have to prove that the herbicides and pesticides used to grow them were also safe – at least generally speaking, with the GMOs we have today. They are manufactured, and marketed to be used in synergy. So let’s get this straight. The best argument little miss chrissy can make against gmos is that we use the same chemicals on them as we do non-gmos. 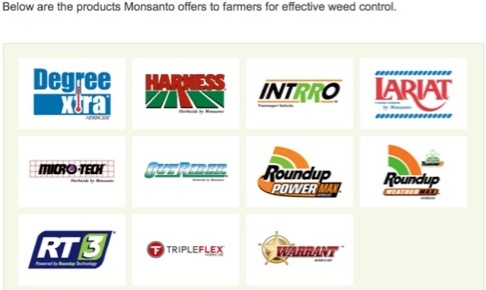 Some herbicides we use more of and some we use less. And the worse thing she can say about the herbicides is that they are as bad as eating red meat. Do you feel better now? And what kind of red meat are you referring to? Organic non-GMO or otherwise? Julie said all red meat in her article. It’s in the processing, that is what is being dismissed. All meats are processed, but the corporate industrialized processing operations are using dangerous additives, so they ship the raw meats to foreign countries and have adults and children in their factories working for 95 cents a month and living at the same factories for $1.12 a month as indentured servants, which increases the profit margins. Didn’t you all see the recent article’s about the foreign factory workers, indentured servants, committing suicide? This means that farm to market time is extended greatly and more additives are necessary to maintain the appearance of freshness, ie chemically induced freshness. I tried to make that point earlier, but Stinky attempted to sidetrack the information. I’m still researching the additives, seems to be some rather elusive information. I can vaguely remember formaldehyde as one of them, but I need to verify that info. Shipping the meat to other countries for processing? Where do you dream up these fantasies? The article said RED MEAT. That includes going to your local butcher and having him cut a steak right in front of you. You are the one that keeps getting side tracked. I’ll retract the outsourcing to foreign sources of meats portion of my comment. There isn’t much information on meats and processing, but I’ll keep looking. This thread isn’t about red meat, so I’ll go to the proper thread and post what I’ve found. Again, thanks Stinky for your usual positive comments. Lets see you have zero research to back up that, and gmos have twenty years worth of real world applications verifying their safety. Game over. property, therefore the developers have control of who views it. You already know this. aircraft sprayed an area, such as cropland. gauze for medical use, found in pharmacies,” he said. Instead of trying to scare people why don’t you actually list the numbers? They found .004 micrograms/gram. Scary isn’t it. Let’s put that into reality. Soil that has never had glyphosate applied to it, tests .005 micrograms/gram. Again, if you get your information from people like Mike Adams or Chrissy, there is a good chance you will be wrong 100% of the time. Thanks for letting the readers know that information and truth is scary, especially if it gives them informed choices. Yes the numbers are so minimal that it would be “ok” to introduce carcinogens through various means to your family and loved ones. Your right screw them, I have health insurance. When the numbers are at or below what occurs naturally in nature you really aren’t introducing anything. You are just trying to scare people with misinformation. Thanks for being a LOSER!!! even allegations of facts, but simply to arouse emotions. expressed in numbers is still a fantasy. And you have a lot of fantasies don’t you. And time and again they have been declared safe. Google gmo dangerous talk for proof from around the world. Yeah let’s “Google” a “Paid Activist” for information. only a moron would reject studies because of where they are posted. It is the studies themselves that should be looked at. You just keep digging yourself a bigger and bigger hole. No wonder no one takes you serious. Incorrect. You’re being way too general. There are literally millions of studies involving genetically modified organisms that are done by academic groups and freely accessible via search engines like Google Scholar. Research about GM commercial crops is a bit more narrow, and what I assume you actually meant when you said “GMO research”. However, this too can be found via Google Scholar, if you take the time to look (which it appears you have not done). Go to Google Scholar. Search “genetically modified “. Viola! Everybody knows about google and people are starting to wake up about all of the COI research studies. Yeah, I suspect anyone with an Internet connection is aware google exists. The question is, how many people know how to use it? 20 years of hidden, protected, data and zero independent peer review research. All the independent and long term research you could ever ask for. Just google gmo dangerous talk. By the way thanks for getting me to post it AGAIN!!! I like it when it can reach as many as possible. Google has AI that screens results, no longer reliable. Research is full of COI issues. I like when I can reveal the truth about peoples links. Who cares about the site if it the evidence that it points to is real and credible. Who care if google screens results as long as it gets you to the site that points to real studies. Again you are only making excuses so you don’t have to face the truth. For everyone else google gmo dangerous talk and find independent and long term research on gmos. That statement has no basis in reality.